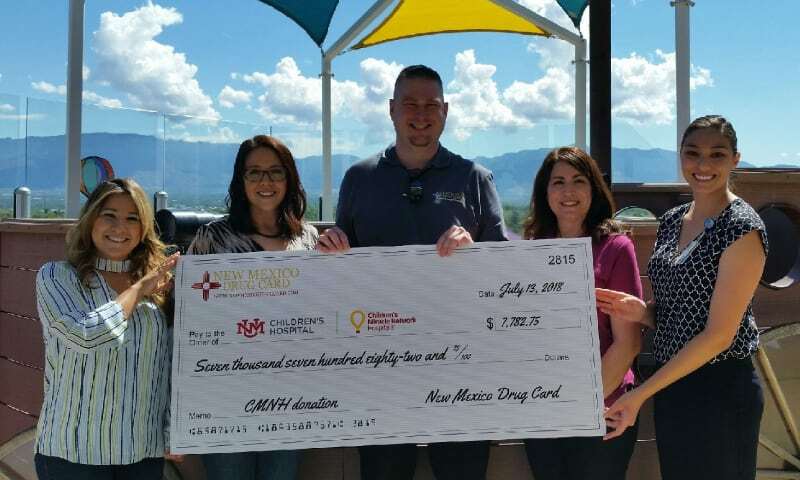 The New Mexico Drug Card team visited and toured the state’s only Children’s Miracle Network Hospital. During this visit New Mexico Drug Card had the opportunity to present a donation of $7,782.75 with the help of this prescription savings program. UNM Children’s Hospital offers complete pediatric care from acute illnesses and emergencies to comlex diseases and developmental disabilities. Through philanthropy, the hospital can provide a certain level of comfort to their tiny patients such as the play area on the rooftop of the 6th floor which has an incrdeible view of the New Mexico skyline. Each time the New Mexico Drug Card is utilized (year-round) a donation is made to UNM Children’s Hospital. Since 2015, the United Networks of America partnership with Children’s Miracle Network Hospitals has raised over $2.4 million dollars for local children’s hospitals. Of this, $7,782.75 has been raised for UNM Children’s Hospital.